CHICAGO -- Not even a giant hot dog can escape the long arm of the law. One of the Oscar Mayer Wienermobiles, a fiberglass behemoth on a national promotional tour, was discovered parked illegally -- hazard lights blinking -- on a major downtown street. The violation in a no-parking zone on ritzy Michigan Avenue earned the driver of the 27-foot sausage a $50 ticket. "The situation was resolved without the use of ketchup, which in Chicago is a big thing," said Matt Smith of the city's Streets and Sanitation Department. The officer who issued the ticket had already called a tow truck when the driver showed up to claim his fiberglass wiener-on-wheels. "We have access to tow trucks that could have handled a Polish sausage, not just a hot dog," Smith said. 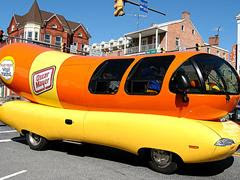 Sydney Lindner, a spokeswoman for Oscar Mayer parent company Kraft Foods Inc., said the Wienermobile, one of several, is traveling the country promoting a contest to sing the Oscar Mayer jingle in a commercial. She said illegal parking is against company policy, "even if you're driving a company vehicle that's shaped like a giant hot dog." It's not the first time a Wienermobile has tangled with the law. An Arizona Highway Patrol officer in June found a Wienermobile parked in a Tucson construction zone and ran its "YUMMY" license plate to make sure it was street legal. The plate came back as stolen, but it was just a mix-up with a similar plate that had been stolen from another of the giant hot dogs in Missouri.